Written by Tilden Chao, 2018. As enticing scents from Ramona Cornell’s cooking penetrate the evening air, kids from Ithaca’s Urban 4-H program dash to the dinner table. Several eager hands reach towards fresh produce, and hungry teens grab a quick bite to eat before they head off to work for the evening. 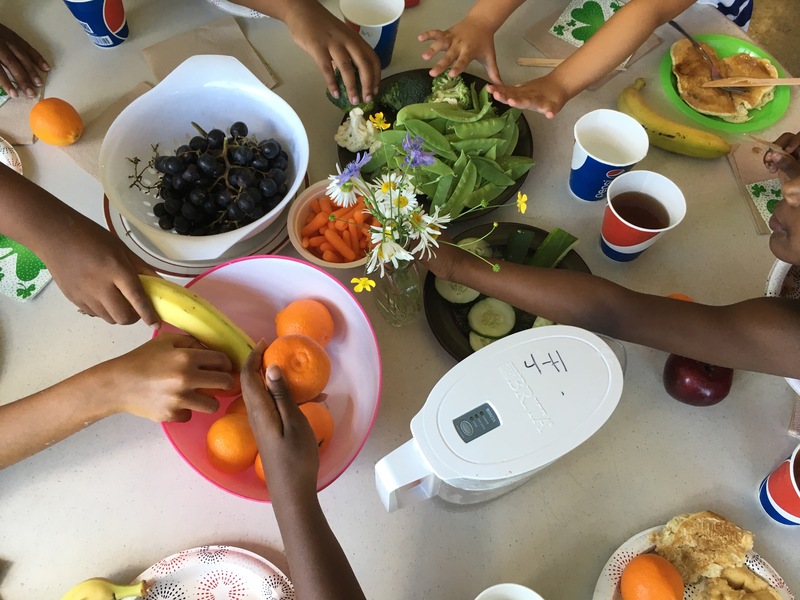 Whether it’s fresh green beans, beautiful garden salads, or cold banana smoothies, program participants leave the table feeling energetic and satisfied. For nearly 40 years, the Urban 4-H program has served the needs of children and teens growing up in low-income urban complexes. Today, programs exist in Belle Sherman, West Village, and the Northside Community Center. Already in 2018, the Friendship Donations Network has saved the Urban 4-H program about $1,700 that would have otherwise been spent on food. While other programs subsist on a shoestring budget, Ramona likens hers to dental floss. With a tight budget, the 4-H program often experiences financial challenges. The money the Urban 4-H program saves reduces budget pressures and keeps the program afloat. Although delicious and nutritious meals are a highlight of the partnership, fresh food has blossomed into something larger in Ramona’s program. Most of the children and teens in Ramona’s program are Burmese refugees. As Ramona explains, “Many girls in the program cook at home. In their culture, food presentation is very important. So, we work on garnishes and plating.” In this sense, teens are able to extract value from more than just a good meal, but also from the artistic experiences that the food offers. Along with the program’s diverse population comes occasional racial strife. During playtime, Ramona noticed children segregating based on race and actively antagonizing one another. But when it came time for food, children began to bond and form amends. “Let’s make pizza!” one exclaimed. A playground rival agreed, “Yeah, let’s make pizza!” And quickly, over pizza, children began to interact with one another and form a more cohesive unit than just moments before. Beyond enjoyable meals and memorable anecdotes, food donations from FDN combat pervasive stigmas in our community. Many people fail to include food justice in the conversation about social justice—many families simply don’t feel comfortable or respected when receiving government-funded aid. While families are often reluctant to stand in line at food pantries or cash in food stamps at the local grocery store, 4-H program leaders can distribute food to individual families out of the public eye. When Ramona has surplus food, she tells her kids to distribute it to their families. “In this sense, it’s more of a gift than a handout,” Ramona explains. Notably, the impact these donations have had on families in the community hits close to home for Ramona. “As a kid, [my family] was one of the poorest families,” Ramona explains, recalling standing in line at the food pantry and waiting for food. From Ramona’s experiences, I began to understand that the quality of food program participants receive is humanizing. While packaged ramen and generic cans may be common at home, program participants enjoy fresh, nutritious, and otherwise prohibitively expensive food with Ramona. The partnership between FDN and the Urban 4-H program is more than about food. It’s about enjoyment, experiences, and humanization of the food distribution process. Most of all, food fosters communities, creating cohesion in a diverse population of program participants.